During the opening session of the Conference a special award was presented on stage. Texas Representative Rick Hardcastle received the “Texas House Member of the Year Award.” He’s from Vernon, TX. 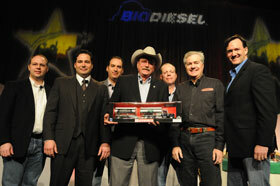 The award is presented annual by the the Biodiesel Coalition of Texas. Making the presentation on stage was Jess Hewitt, Gulf Hydrocarbon, Inc.